Goodarzi, P., Mohebbi, V. (2017). Kinetics of Propane Hydrate Formation in Agitated Reactor: A Mass Transfer Approach. Iranian Journal of Chemical Engineering(IJChE), 14(2), 48-58. P. Goodarzi; V. Mohebbi. "Kinetics of Propane Hydrate Formation in Agitated Reactor: A Mass Transfer Approach". 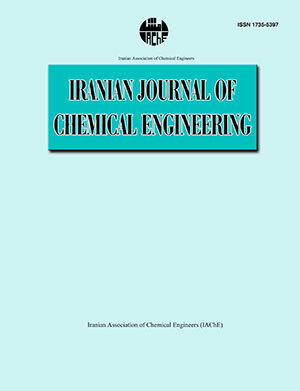 Iranian Journal of Chemical Engineering(IJChE), 14, 2, 2017, 48-58. Goodarzi, P., Mohebbi, V. (2017). 'Kinetics of Propane Hydrate Formation in Agitated Reactor: A Mass Transfer Approach', Iranian Journal of Chemical Engineering(IJChE), 14(2), pp. 48-58. Goodarzi, P., Mohebbi, V. Kinetics of Propane Hydrate Formation in Agitated Reactor: A Mass Transfer Approach. Iranian Journal of Chemical Engineering(IJChE), 2017; 14(2): 48-58. Understanding the kinetics of gas hydrate formation is essential to model and predict the hydrate formation (or dissociation) process. In the present paper, we investigated the formation of pure propane gas hydrate as a former gas. In this regard, several experiments were conducted to measure the rate of hydrate formation under various pressures (410 to 510 kPa) and temperatures (274 K to 277 K) in a controlled temperature stirred reactor. It was observed that propane consumption rate can be assumed constant with time. Mass transfer approach was used to estimate the mass transfer coefficient in the gas-liquid contact area as a function of pressure and temperature. Results indicated that mass transfer approach can predict the kinetics of propane hydrate formation. In other word, it is reasonable to assume that this process is a mass transfer limited phenomena and the mass transfer in the liquid side the gas-liquid contact area controls the hydrate growth. Chun, M. K. and Lee, H., “Kinetics of formation of carbon dioxide clathrate hydrates”, Korean J. Chem. Eng., 13 (6), 620 (1996). Sloan Jr, E. D. and Koh, C., Clathrate hydrates of natural gases, CRC press, (2007). Fandiño, O. and Ruffine, L., “Methane hydrate nucleation and growth from the bulk phase: Further insights into their mechanisms”, Fuel, 117, 442 (2014). Sum, A. K., Koh, C. and Sloan Jr, E. D., “Clathrate hydrates: From laboratory science to engineering practice”, Ind. Eng. Chem. Res., 48, 7457 (2009). Chatti, I., Delahaye, A., Fournaison, L. and Petitet, J., “Benefits and drawbacks of clathrate hydrates: A review of their areas of interest”, Energy Conv. Manag., 46, 1333 (2005). Nazridoust, K. and Ahmadi, G., “Computational modeling of methane hydrate dissociation in a sandstone core”, Chem. Eng. Sci., 62, 6155 (2007). Ribeiro, C. P. and Lage, P. L., “Modelling of hydrate formation kinetics: State-of-the-art and future directions”, Chem. Eng. Sci., 63 (8), 2007 (2008). Vysniauskas, A. and Bishnoi, P., “A kinetic study of methane hydrate formation”, Chem. Eng. Sci., 38 (7), 1061 (1983). Englezos, P., Kalogerakis, N., Dholabhai P. and Bishnoi, P., “Kinetics of formation of methane and ethane gas hydrates”, Chem. Eng. Sci., 42 (11), 2647 (1987). Monfort, J., Jussaume, L., El Hafaia, T. and Canselier, J., “Kinetics of gas hydrates formation and tests of efficiency of kinetic inhibitors: Experimental and theoretical approaches”, Annals NYA Sci., 912 (1), 753 (2000). Clarke, M. A. and Bishnoi, P., “Determination of the intrinsic kinetics of CO2 gas hydrate formation using in situ particle size analysis”, Chem. Eng. Sci., 60 (3), 695 (2005). Skovborg, P. and Rasmussen, P., “A mass transport limited model for the growth of methane and ethane gas hydrates”, Chem. Eng. Sci., 49 (8), 1131 (1994). Bergeron, S. and Servio, P., “Reaction rate constant of propane hydrate formation”, Fluid Phase Equilib., 265 (1), 30 (2008). Mohebbi, V. and Behbahani, R.,“Measurement of mass transfer coefficients of natural gas mixture during gas hydrate formation”, Iranian J. Oil and Gas Sci. Eng., 4, 66 (2015). Mohebbi, V., Naderifar, A. , Behbahani, R. and Moshfeghian, M., “Investigation of kinetics of methane hydrate formation during isobaric and isochoric processes in an agitated reactor”, Chem. Eng. Sci., 76, 58 (2012). Li, B., Li, X., Li, G., Wang Y. and Feng, J., “Kinetic behaviors of methane hydrate formation in porous media in different hydrate deposits”, Ind. Eng. Chem. Res., 53, 5464 (2014). Treybal, R., Mass transfer operation, 3rd ed., (1980). Prausnitz, J., Lichtenthaler, R. and De Azevedo, E., Molecular thermodynamics of fluid-phase equilibria, 3rd ed., Prentice Hall, (1999). Herri, J. M., Pic, J. S., Gruy, F. and Cournil, M., “Methane hydrate crystallization mechanism from in‐situ particle sizing”, AIChE Journal, 45 (3), 590 (1999). Hashemi, S., Macchi, A. and Servio, P., “Gas hydrate growth model in a semibatch stirred tank reactor”, Ind. Eng. Chem. Res., 46 (18), 5907 (2007). Malegaonkar, M. B., Dholabhai, P. D. and Bishnoi, P. R., “Kinetics of carbon dioxide and methane hydrate formation”, The Canadian J Chem. Eng., 75 (6), 1090 (1997). Mohebbi, V., Naderifar, A. , Behbahani, R. and Moshfeghian, M., “Determination of Henry’s law constant of light hydrocarbon gases at low temperatures”, J. Chem. Therm., 51, 8 (2012). Soave, G., “Equilibrium constants from a modified Redlich-Kwong equation of state”, Chem. Eng. Sci., 27 (6), 1197 (1972). Naseh, M., Mohebbi, V. and Behbahani, R., “Investigation of ethane hydrate formation during isobaric and isothermal conditions”, J. Chem. Eng. Data, 59, 3710 (2014). Green, D. and Perry, R., Perry's chemical engineers' handbook, 8th ed., McGraw-Hill Education, (2007).